Lowdown: The Johnnie Walker Championships returns to the majestic surroundings of Gleneagles where Frenchman Grégory Havret will defend the title. A strong field is assembled to do battle over the course that will play host to the Ryder Cup in 2014. Set in the stunning Perthshire countryside, Gleneagles has been host to this event since 1999 and the PGA Centenary Course is regarded highly amongst the European Tour professionals. Colin Montgomerie, the 2010 Ryder Cup captain, is Championship chairman this week and is looking forward to competing on home soil. “The Johnnie Walker Championship at Gleneagles is one of my favourite events in the year, not least because it allows me to play here near my new home in Perthshire.” Said the 46 year old. In 2008 Havret won the tournament in dramatic style. The Frenchman shanked his third shot to the par-5 closing hole but then got up-and-down from the greenside bunker to win the title by a single shot from Graeme Storm. The enthusiastic crowds who always flock to Gleneagles will be hoping for similar excitement this time round. Niclas Fasth – A gritty competitor, Fasth is showing signs of returning to the form that has won him six events on the European Tour. A good performance in Holland last week suggests he’s ready to re-enter the winner’s enclosure. 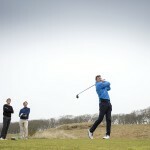 Marc Warren – The 2007 champion will look to raise his game for this event. He’s had a disappointing season so far but has the ability to produce inspired golf when competing on home soil. He’ll look to do just that this week. Peter Lawrie – The Irishman will be hoping to continue the solid form he displayed last week at the KLM Open where he finished in a tie for second. Key Hole: 18th. A par 5 of 533 yards, it gives players a real chance of finishing with a birdie, or maybe even better. There could be big swings right at the death. Skills Required: Breaking free of the pack. Scoring at the Centenary Course tends to be good and the field seems to bunch. Someone will probably win it by a nose as Havret did in 2008.